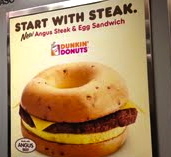 Saw this Dunkin’ Donuts ad on train today. …(may) end with a heart attack! Categories: In and around Boston, Non-vegetarian | Tags: beef, breakfast, Dunkin' Donuts, heart attack, sandwich, steak | Permalink.